Polynesian technology has arrived in Mendocino! 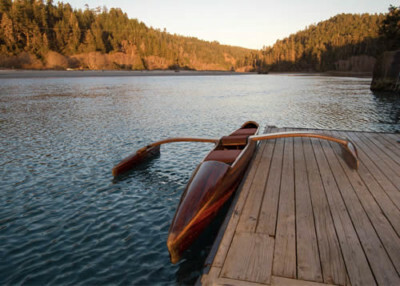 The evolution of modern-day canoe design is prospering in Mendocino County. Bob Cummings of Secret Harbor Boat Works has been hard at work for more than 30 years building redwood outriggers. Working closely with Catch a Canoe, the Stanford Inn’s outdoor adventure shop, Bob has created several unique variations that all share certain key elements. A foot-operated rudder system allows easy control for both novice and experienced paddlers. The outrigger floats, or the twin hulls of the catamaran, provide a measure of stability not found in other canoes or kayaks. In addition, the narrow, efficient hull and float design reduces the amount of effort typically needed for canoe propulsion. The Canine Cruiser series was created specifically for people and their pets. A raised padded floor provides a comfortable area for dogs to sit, stand or lie down, while the outrigger floats ensure superior stability. Other redwood outriggers can accommodate couples or families, and hold between 2 and 8 persons. 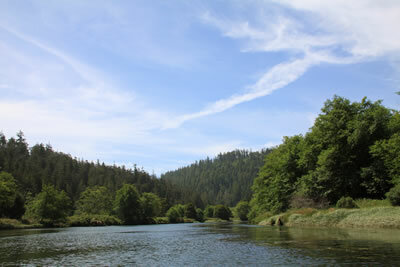 Safety, ease of control, and the beauty of re-purposed old growth redwood all combine to make a voyage up big river an unforgettable experience. Dock photo featured in “Outside Magazine” April 2018. Photo by Rick Hemmings. Even though we specialize in redwood outriggers, polyethylene kayaks are available in both sit on top and decked versions. Single and tandem versions can be rented with no prior experience required. 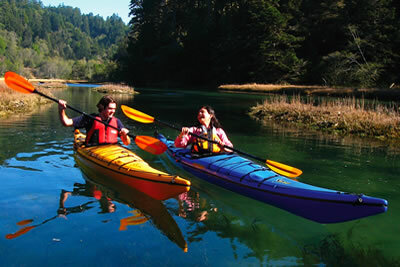 Kayaks sit lower to the water and provide an easy ride with a double bladed kayak paddle—expect a slightly wetter experience due to paddle drips and sit on top dynamics. 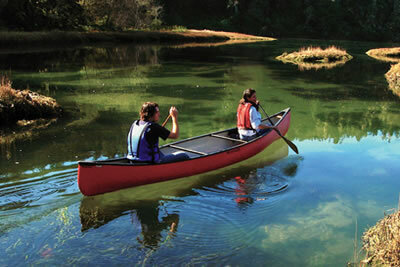 Catch a Canoe’s first rentals were fiberglass canoes made in Los Angeles called Nona’s. We still have one available after 45 years in service! We also offer kevlar canoes from Wenonah. The star of the show however, are our unique, locally made redwood outriggers. Even if you’re old school when it comes to canoes, why not try something new?—you’ll still get to use a wood or kevlar canoe paddle with every stroke! 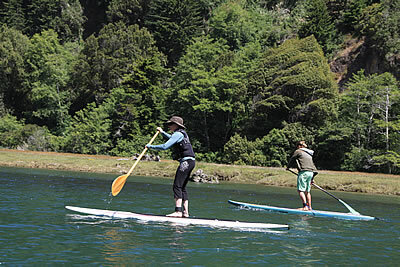 Big River Estuary can be the perfect place to try this popular new sport—depending on the conditions that is. Calm mornings with a slowly moving tide is best, please check in with Catch a Canoe for updated reports. We offer lightweight composite boards from Boardworks. The Raven is 12’ long and very stable, while it’s bigger 14’ brother, the Great Bear is best for first timers. Reservations are offered seasonally and only for paddle-craft. During fall, winter & spring boats may be reserved beforehand. This period lasts from Labor Day through the start of Memorial Day weekend. First come first serve and no reservations are in effect from Memorial Day until the start of Labor Day weekend. Exception: Parties of 8+ may reserve year round. Big River looks tantalizingly moody and gorgeous, its slinky coils meandering over grassy flats and vanishing into a deep gorge defined by the dark towering presence of coastal redwoods.